The University of the Philippines College closes its second semester concert season 2013-14 with the UP Symphonic Band on March 20, 2014 at 6:30 PM. Abelardo Hall Auditorium, Quezon City. 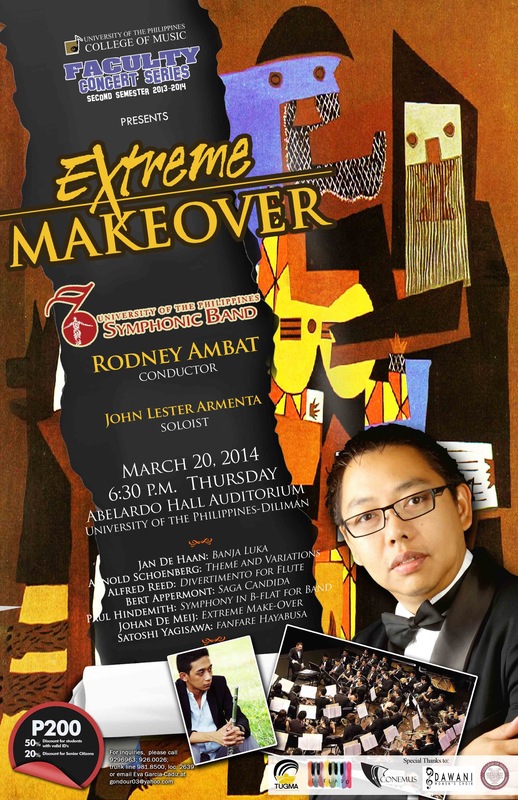 Billed “Extreme Make-Over,” the concert will be conducted by Prof. Rodney Ambat and will feature original contemporary symphonic band compositions by world composers. The concert is Ambat’s third since 2012, in which modern and postmodern symphonic band music is offered to the Filipino public. The seven works on 20 March are all Philippine premieres and are some of the most challenging contemporary symphonic band repertoire. The programme will start with “Banja Luka” composed by Jan de Haan (b. 1951). This piece portrays the composer’s feelings about the civil war in the Balkans in early 1990s. This will be followed by “Theme and Variations, op. 43 by Arnold Schoenberg and Alfred Reed’s “Divertimento for Flute,” the solo part of which will be played by Lester Armenta, a senior member of the band and a prize winner in Flute NAMCYA competition. “Saga Candida,” a concert suite by Bert Appermont ends the first part of the concert. Symphony in B-flat for Band by a German composer Paul Hindemith will start the second half. This will be followed by the highlight of the evening, a piece titled “Extreme Make-over” by Johan de Meij. “Extreme Make-over for Wind Orchestra” is a neo-classical piece that transforms, as in postmodern parody and quotation, famous themes from Peter Ilyich Tchaikovsky such as “Andante Cantabile,” Fourth and Sixth Symphonies, and Fantasy-Overture “Romeo and Juliet .” The evening will end with “Fanfare-Hayabusa” by Satoshi Yagisawa. Tickets are at 200 pesos each, with 25% discount to students and senior citizens. For details, please contact the UP College of Music (02) 929-6963. 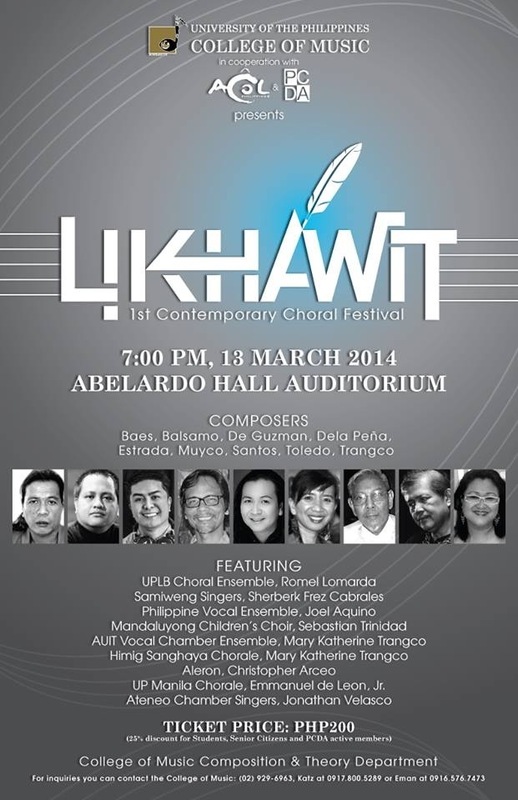 The University of the Philippines College of Music, in cooperation with the Asian Composers League and the Philippine Choral Directors Association, presents original contemporary Filipino compositions for choirs in a concert billed “LikhAwit” at the Abelardo Hall Auditorium on Thursday, 13 March 2014, 7:00 o’clock in the evening. These choral compositions are by some of the Philippines’ finest Filipino composers such as Ramon Santos, Josefino Toledo, Maria Christine Muyco, Laverne Dela Peña, Jonas Baes, Mary Katherine Trangco, Feliz Anne Macahis, Jude Edgar Balsamo, Robin Estrada, and Von De Guzman. Their works will be interpreted by Ateneo Chamber Singers (Jonathan Velasco, conductor), UP Manila Chorale (Emmanuel de Leon, Jr.); UP Los Baños Choral Ensemble, (Romel Lomarda); Aleron, (Christopher Arceo); Samiweng Singers, Ilocos Norte National High School, (Sherberk Frez Cabrales) Philippine Vocal Ensemble ( Joel Aquino); Mandaluyong Children’s Choir (Sebastian Trinidad), AUIT and Himig Sanghaya (Mary Katherine Trangco).